The most annoying performance of the year is in our midst, and it’s in The Mist. Frank Darabont’s adaptation of the Stephen King short story about goofy-looking monsters that invade an isolated town features Marcia Gay Harden as a haranguing prophet of doom so obnoxiously over-the-top that she makes Jim Jones look like Jesse Jackson. Harden’s Mrs. Carmondy would bring the whole production down if it weren’t already flawed for other reasons. A movie called Who is Norman Lloyd? better answer its own question. Fortunately, the conventional documentary using that title does just that. A kind, engaging portrait of the 94-year-old veteran actor Lloyd, the movie (directed by Matthew Sussman) applies the Forest Gump effect to show business, revisiting seminal moments in the history of stage and screen production while inserting Lloyd into the legacies of widely acknowledged artisans like Orson Welles, Alfred Hitchcock and Jean Renoir. If Crispin Glover made his latest experimental odyssey to satisfy his own grotesque dreams, it would be easy to bemoan the senselessly twisted vision as it appears in the plot. But IT IS FINE! Everything is Fine, the second entry in Glover’s “It” trilogy (preceded by What is It? in 2005) derives a nightmarish sexual fantasy straight from the source. Even if Richard Kelly’s Southland Tales weren't so fiercely politicized, it would still be a tremendously polarizing work of art. 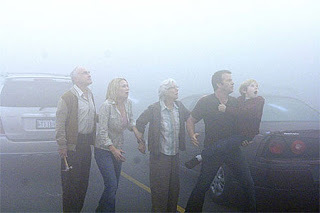 Set in an alternate 2006 reality where World War III began the previous year with the detonation of a nuclear bomb in Abilene, Tx., and society has become riddled with paranoid surveillance, the film succeeds as a series of contextualized paraphrases rather than a unified story. Kelly creates vague situations just crazy enough to function according to their own logic, allowing momentary lapses in its steadfast incoherence; much of Southland Tales relies on paradigmatic symbolism, easy to read in individual clauses despite not quite gelling together. Early in the new documentary What Would Jesus Buy? 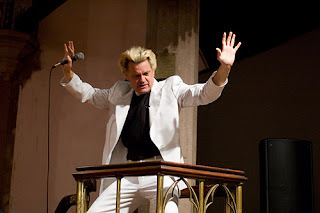 (opening this weekend at Cinema Village), New York City staple Reverend Billy holds up a stuffed Disney character and declares, “Mickey Mouse is the Antichrist!” to a very bemused department store crowd. Preachers love to parse the curious nature of sin, but few pundits have honed a unique and broadly appealing stance of the caliber put forth by the heated founder of New York’s Chuch of Stop Shopping. With a spirited choir echoing his rants, the Reverend (aka Bill Talen) rallies against the misguided cultural marriage of religion and economic consumption. It’s hardly your average fire-and-brimstone rant: Neatly embedded in the Reverend’s strident enunciations of unholy behavior lies the clear-cut delivery of brilliant performance art. There was more energy, emotion and excitement in Christopher Walken’s toy store song-and-dance sequence with Michelle Pfeiffer in Hairspray than all the cheeriness and bright colors filling the screen throughout Mr. Magorium’s Wonder Emporium. 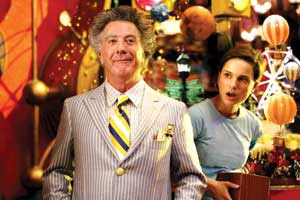 A misguided kid flick that’s exuberant without achieving coherence, Magorium follows the waning days of the titular toy peddler (Dustin Hoffman), a strange wizardly fellow planning to transfer ownership of his magical shop to his cutesy assistant (Natalie Portman). Writer-director Zach Helm fills scenes with the organic trinkets in Magorium’s store, but he doesn’t give it any greater significance beyond the hodgepodge of clever special effects. Hoffman puts on the weirdest performance of his career, playing the crazed Magorium with vigor matched only by his goofy hairstyle, but there’s nothing in the story to match that otherworldly sprightliness. He’s like Willy Wonka without the chocolate. Adaptations tend to pare down their sources, hacking away at the verbose qualities of the written word in order to extrapolate something movie-like. In Mike Newell’s envisioning of Love in the Time of Cholera, however, much of the production effort seems dedicated to synopsizing the prose of Gabriel García Márquez’s 1985 novel. The result is an extravagant costume drama with a heavy bag of visual splendor, but nothing that really distinguishes it as an original work of art. Scenes play out as though the descriptive rhythms of Márquez’s style were scrawled on the back of lavish animated postcards. A great cover story in the New York Press reveals the desperate people who responded to a phony Craigslist ad seeking writers willing to work while the WGA continues its strike. A swift, amusing read and a very original way to tackle a story in danger of growing old before its central issues get resolved. I snapped the cover photo (a variation on the one above) during a visit to the strike rally outside the News Corp. building last week. There’s no question that Fred Claus, an insipid comedy from Warner Bros. about Santa’s wayward sibling, has all the ingredients of a bad movie, but the flaws are revealing of a larger problem. Unable to sustain its one-note premise, the story foolishly revels in the mythology of Christmas to mask comedic vapidity. The trick doesn’t work. With Vince Vaughn in autopilot as foul-mouthed clod Fred, the movie carries the illusion of subversive storytelling, but it really plays nice. In Steve Barron’s Choking Man, an ultra-low budget production about urban alienation and immigrant despair, griminess is a form of solace. 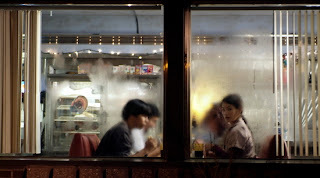 As the soft-spoken protagonist, an Ecuadorian kitchen worker named Jorge (Octavio Gómez), slowly wastes away washing dishes in a Queens diner, the leftovers from patrons’ plates dominate his field of vision and catalyze his daydreams. Barron uses bright yellow animations to represent Jorge’s avoidance of his mundane reality, a dreary world of brown and grey tones where his own presence never feels quite solid. Language and timidity are his primary foes. His vindication comes from abstractions. Holocaust survival tales have never lacked dramatic tension. History is an easy crutch when it comes to the construction of hazardous scenarios, whether they’re profound or facile: Both Schindler’s List and Life is Beautiful build staying power out of their relationships to events beyond their specific storylines. In Steal a Pencil for Me, the new documentary about a couple whose concentration camp experiences were preceded by their romantic entanglement, the survival narrative pulls together an ubiquitous significance, whether or not you actually care about the couple’s romantic adhesion. The summative superlatives being aimed at No Country for Old Men belie the film's individual significance. 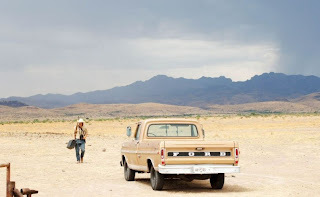 An adaptation of Cormac McCarthy's 2005 novel of twisted thievery and murder in a decaying corner of West Texas in 1980, the movie only shares superficial qualities with the previous work of filmmakers Joel and Ethan Coen. As a result, the stream of hyperbole declaring No Country to be the Coen brothers’ finest accomplishment -- accolades (including my own) that have enshrouded its reputation since it debuted at the Cannes Film Festival earlier this year -- don't do justice either to the film or its creators' oeuvre.